We are pleased to present “Continental Drift: Printmakers Converge”, an exhibit of work by members of the Boston Printmakers and the Icelandic Printmakers Association. This cross-cultural show was inspired by the Boston Printmakers August 2014 trip to Iceland and the resulting collaboration between the two groups of artists. “Continental Drift” showcases the similarities as well as the differences that exist between the two printmaking groups—but ultimately forges a bridge between the two cultures. “Continental Drift” showcases the art that was created during that process—first exhibited in Reykjavik two months ago and now displayed in Belmont and Newton. The Belmont Gallery of Art’s Opening Reception for “Continental Drift” takes place Friday, Oct. 24, 6-8pm. The Scandinavian Center’s Nordic Hall will host its Artists Reception and Talk, Thurs., Nov. 20, 5:30-7:30pm. In addition, the Belmont Gallery of Art will host an Artists Print Talk with American and Icelandic printmakers Nov. 23, 2-4pm. 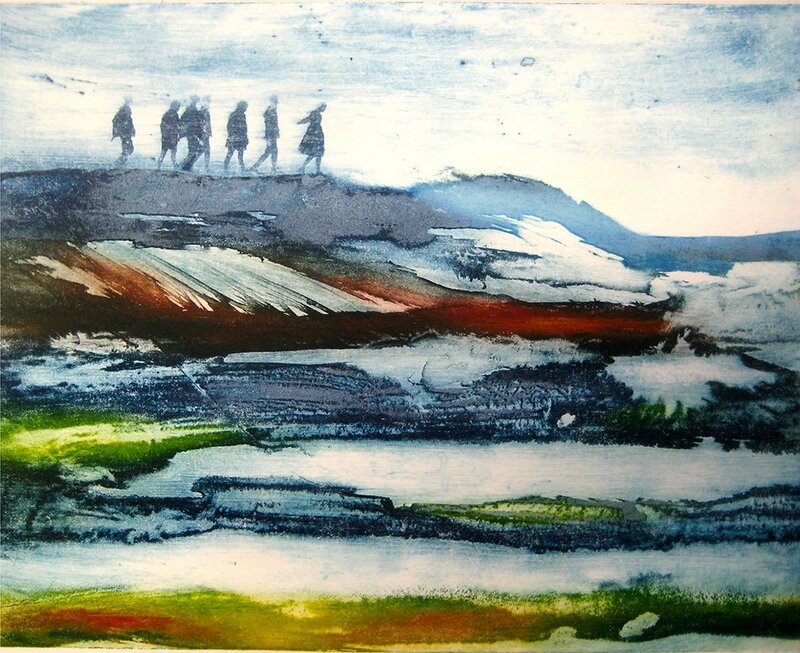 “The exhibit’s title, “Continental Drift: Printmakers Converge,” reflects the action of cultures, and continents, coming together via printmaking–colliding–if you will—and then drifting apart,” says Boston Printmakers artist Bob Tomolillo, who organized the group’s trip to Iceland. Tomolillo says that art is everywhere in Iceland and that the visitors from the US were inspired by what they saw in the country’s strive to protect its cultural heritage and connection to the “sacred” landscape. Society has long embraced the printed image: from the earliest depiction of saints in medieval woodcuts through Andy Warhol’s Pop Art silkscreens of modern day symbols. Printmaking as an art form is practiced around the globe—with the images as varied as the regions and cultures that practice the craft. “ Continental Drift: Printmakers Collide” gives art lovers the opportunity to celebrate printmaking traditions—new and old–from two unique–yet connected–world cultures: the US and Iceland. The 60+ prints in the “Continental Drift: Printmaker’s Converge” exhibits showcase a variety of ancient and modern printmaking techniques including etching, Chine-colle, silkscreens, monoprints, woodcuts, intaglio, lithography and digital and electro-photo processes. Nordic Hall Icelandic Prints exhibit/Artists Talk information can be found at www.scandicenter.org.